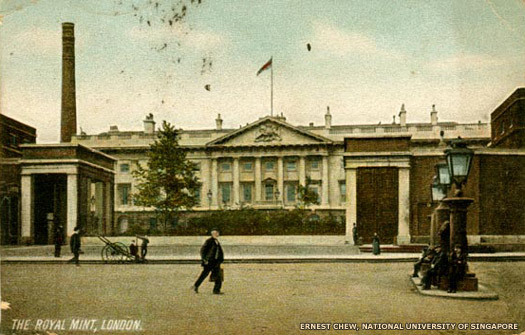 The UK was one of the last countries to adopt a decimal monetary system, although there had been discussion on and investigations into the subject since the early nineteenth century. The topic was pursued intermittently for a century and a half, sometimes in conjunction with the adoption of the metric system of weights and measures. It was generally agreed that the changeover was necessary - it would simplify accounting, business and trade by a considerable degree, and would save a great deal of schooling in arithmetic. Various official investigations, a number of books and many other publications, and much discussion in various quarters, as well as the formation of the 'Decimal Society', were involved in the process. There were a variety of decimal coinage systems proposed - some of them as complicated (to modern eyes) as the system they were intended to replace, and several bordered on the incomprehensible or impractical. The use of gold and silver as coinage metals - rather than the present system of coins having a purely nominal value - influenced nineteenth century discussions, as did the relative low value of inflation for much of the period. In the nineteenth century and early twentieth century a system based on £1 (one pound sterling) being equal to 1000 minor units (with several intermediary coins) was the most popular option and later on, with the effects of inflation, the lesser unit was fixed at a hundred minor units to the pound. Other options suggested at various points included 10s (ten shillings), the crown (five shillings, a quarter of a pound), the florin (two shillings, introduced as a tenth of a pound), and units based variously on a thousand farthings or a hundred pennies. The nineteenth century's choice of the pound being equal to 1000 minor coins reflected contemporary prices, and the seemingly easy conversion from the existing 960 farthings to the pound - and the perceived benefits to the poor of fractional prices, who would, it was claimed, be happy to receive more coins for their pennies and sixpences, and the greater flexibility afforded. As part of the discussion in this period it was pointed out that in several quarters it was the practice to convert all monies into decimal equivalents, carry out transactions, and then convert the figures back to 'real money'. It was recognised that there would be 'issues' in some areas - for example the penny post and other 'fixed costs' - as there were no direct equivalents between existing coins and the replacements. There was a greater emphasis on establishing the values of the coins and how the two systems would tally than on the longer term impacts. More important were areas of concern such as the cost of conversion, the potential for inflation, and the likelihood of confusion if coins were redenominated, although some of this would have been resolved had there been a move towards implementing a new system. The debate, and official investigations continued into the twentieth century, by which time virtually all major and many minor economies outside the British empire had adopted decimal systems (and had sometimes gone through a number of different systems of monetary units). The real shift towards the adoption of decimal currency occurred from the 1950s with the rise of international trade, and various members of the British empire and Commonwealth adopting decimal currency. The Halsbury Committee was established in 1961. This reported on decimalisation in 1963, the majority report being in favour of the pound as the basis. The chief alternative proposal was based on a ten shilling unit (such as had been adopted in several Commonwealth countries), and the proponents for this argued their case. Other suggestions were made, with units from five shillings via a hundred old pence to £5 (five pounds) - the latter to take into account inflation by the time the system was actually adopted, none of which received significant support. An octal system was suggested, with Sir Fred Hoyle erroneously arguing that it would be more computer friendly (some makes of computer actually 'preferred' hexadecimal (base 16) to octal). Counter arguments included the point that computers were made to make life easier for humans, not the reverse. A duodecimal system was also suggested (a society promoting a base-twelve was still active in 2009), but this was not taken up. Base-ten was the normal usage for currency elsewhere. 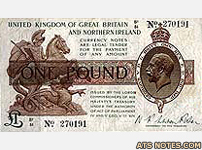 In 1966 the pound was adopted as the main unit. In support of this, chancellor of the Exchequer (and later prime minister), James Callaghan argued that the claimed benefits of the ten shilling unit were purely temporary and limited, whilst possibly leading to inflation (as the minor unit would go from one old penny to the equivalent of 1.2 old pennies). Again there was much debate as to the coins to be used and their names - 'cent' was favoured by some for the smaller unit, but 'new penny' (eventually to be shortened to penny) was adopted. The system was made technically non-decimal by the introduction of a half-unit coin, to accommodate values covered by the existing penny. It was suggested (as in previous discussions) that the shilling be made equivalent to ten pennies (down from twelve in Imperial currency), there being no indication on the units of money as to their interrelationships, but this was rejected as likely to lead to hoarding and similar complications. A 'Decimal Currency Board' was set up (alongside several other such bodies, covering inter alia East Africa, West Africa, and the Pacific). Under the chairmanship of GLC Leader William Fiske (afterwards Baron Fiske), it carried out a good deal of work, including the provision of educational material and publications. There were also two competitions, one secret and the second open, to find a design for the new coins. As with the 'millennium bug' of around thirty years later, but in practice more practical, a minor industry arose to cater for the conversion: dual use equipment (which could, of course, be used with existing decimal currencies as well), training provision, and publications. Robert Maxwell, then owner of Pergamon Press and also an MP, saw the potential profit in issuing books and other materials on the subject. A two shilling coin, or florin, from 1964. Florins were produced for Queen Elizabeth II each year between 1953 and 1967, with proof coins again produced in 1970. 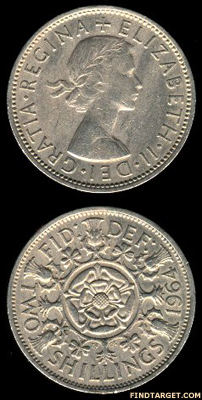 The obverse shows the Mary Gillick head of Queen Elizabeth, inscribed ELIZABETH II DEI GRATIA BRITT OMN REGINA (1953 only) or ELIZABETH II DEI GRATIA REGINA (all other years), while the reverse shows a Tudor rose in the centre surrounded by thistles, shamrocks, and leeks, with the inscription FID DEF TWO SHILLINGS 1964. 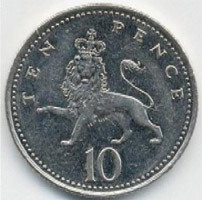 In accordance with the plan for currency decimalisation, from 1968 the decimal ten pence coin was introduced at the same size, weight, and metal composition as the florin. Accordingly the florin (usually dated 1947 or later) remained in circulation until the size of the decimal ten pence was itself reduced in 1992. Earlier florins had been made of an alloy containing 50% or 92.5% silver, and had mostly already been withdrawn to retrieve the valuable metal. Remaining florins and the larger 10p coins were finally demonetised in 1993. The situation in countries which were decimalising at the time was studied and learnt from. One of the marketing strategies was to point out that those companies in Australia which had decided to leave the acquisition of equipment and training until the last moment had found it difficult to make arrangements - and lost customers to those firms which had already done so and therefore provided a quicker service. As mentioned, publicity material and educational material were provided for the general public and for educational establishments - and it was argued that with increasing travel abroad people were already familiar with decimal currency. There was a certain amount of counter-argument - or baseless problems: it was argued that claims by shopkeepers that people would be wandering around with pocketfuls of the new currency but unable to work out how to use it were fallacious. As with the earlier period, differences in culture and attitudes are regularly visible - most notably the situation and attitudes towards women, with remarks made about 'the housewife' that would now be seen as patronising. However, the situation was that men were in positions of authority and the housewife was in charge of the household - she did most of the shopping and would be at the forefront of using the new coinage. 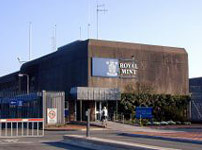 The Royal Mint was moved from its existing site at Tower Hill, London, to a new site in Wales, partly because the existing site was too small and also due to the then existing policy of moving industry to the regions (there being relatively high unemployment in the new catchment area). Coins were struck over several years - although all of them with the intended date of use - and consideration was given to factors such as the premature death of the queen, popular rejection of the new currency, or the Mint being damaged by Welsh nationalists (some of whom at the time adopted less than peaceful methods). In the event there were some delays - caused by a postal strike early in 1971. The half-crown (2/6, or two shillings and sixpence) and old half-penny were withdrawn ahead of the transition for the sake of convenience. The first decimal coinage was issued in 1968 - the equivalents of the shilling and florin - these being the 5p and 10p. The ten shilling note was replaced by a new 50p coin. This was announced (and introduced) later, in 1969, after a specimen set or introductory pack in a vinyl wallet had been made available, which consisted of 5p and 10p coins (both dated 1968) and 1/2p, 1p, and 2p coins (all dated 1971). The three smaller coins, 2p, 1p and 1/2p, were introduced into general circulation on 15 February 1971 (this being one of the quieter times of year). The banks had been shut for several working days to allow for essential activities. Shops were opened as 'old currency' and 'new currency.' It had been expected that the transition would take some two years, but in fact it took a matter of weeks - sufficient for the Decimal Currency Board to be wound up in 1971. A range of its documents were released by the Public Records Office and the National Archives in 2001 to mark the thirtieth anniversary of the event. In 2008, to mark the issue of a new design for the existing coins (the 1/2p having been dropped, and three new coins being added, with values of 20p, £1, and £2) a small exhibition at the British Museum included a section on decimalisation. Text copyright © Jackie Speel with corrections and additions provided by Ron Haller-Williams. An original feature for the History Files.